Wow! The folks at Team Magic KNOW WHAT THEY’RE DOING! And the Friends of Cedars of Lebanon State Park were thrilled to be a part of their 10th Annual Cedars Of Lebanon Triathlon on Saturday, 17 May 2014. It was a cool, cloudy, beautiful day, perfect for racing. I can say that because I didn’t have to dive into that swimming pool at 8:00 AM. Although all the triathletes got wet, none of the volunteers did. Luckily, the Cedars of Lebanon State Park was among the 50% that the weather forecasters predicted would not get rain. Beginning at 6:00 AM Saturday morning, 425+ triathletes, over 100 volunteers, all of the Team Magic staff and hundreds of spectators descended upon Cedars of Lebanon State Park, and everything went off without a hitch. I cannot imagine the hours of planning and set up that go into this event, but Team Magic obviously do their homework, and it showed! What teamwork! And the Friends of Cedars of Lebanon State Park enjoyed helping out. The Friends of Cedars of Lebanon State Park thank the amazing Team Magic crew for allowing us to participate. Also, thanks to the Heimerdinger Foundation, the Narrow Gate Artisans, and the Boy Scout Troop volunteers who helped make this event such a success. We look forward to the 2015 Cedars of Lebanon Triathlon. 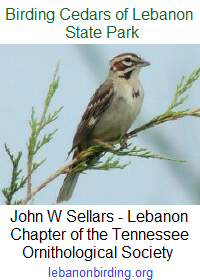 This entry was posted in Public Event and tagged Cedars of Lebanon State Park, Cedars of Lebanon Triathlon, FoCoLSP, friends of cedars of lebanon, Tennessee State Parks. Bookmark the permalink.